Irritated, itchy skin may prompt your dog to scratch, lick, and chew itself to the point of injury in an attempt to find relief. This obsessive behavior is most likely caused by an infestation, infection, or allergy that has the potential to make your dog miserable and leave you wondering what’s going on and how you can help. Unfortunately, such skin irritations are common in dogs, but the good news is, they can be effectively treated or managed with a combination of home care, preventive measures, and veterinary intervention. Why Do Dogs Have Skin Irritation? 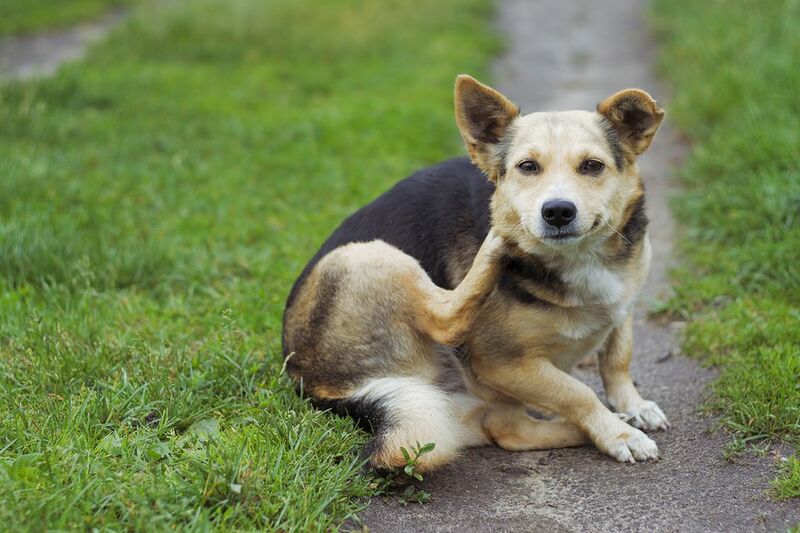 There are many potential reasons for your dog's itchy skin. In some cases, the cause is obvious, such as when your dog has fleas. In others, pinning down the problem may take some time and sleuthing. Once you and your vet get to the root of the problem, you can develop a treatment plan so your dog will be comfortable again. It's relatively common for dogs to be affected by one or more external parasites. These tiny critters live on or in your dog's skin and can cause a lot of irritation and itching. Fleas: Flea allergy dermatitis is an allergic reaction to flea saliva, which is caused by flea bites. Ticks: During tick removal, it's possible for bacteria to be injected into your dog's skin. If this happens, the skin may show signs of irritation within a few days. Mange: Sarcoptic mange (canine scabies) and demodectic mange are both caused by different skin mites. A dog infested with either mite experiences intense itching in the affected areas. Proper diagnosis and identification by your veterinarian are critical for correct treatment. Skin infections show up relatively frequently in dogs too. An infection may be caused by contact with microscopic bacteria or fungi that infect the skin. Bacterial infection: Pyoderma is a bacterial infection typically caused by Staphylococcus bacteria (commonly called staph). Bacterial infections are often secondary to allergies and sometimes cause hot spots in dogs. This is perhaps the most common type of canine skin infection. Yeast infection: Malassezia dermatitis is a fungal infection caused by an overgrowth of the body's normal yeast. Yeast infections may also be secondary to allergies. Ringworm: Despite its name, this is not an actual worm. It's a contagious fungal infection that can affect pets and humans. Ringworm causes round patches of itchy skin and hair loss. Canine atopic dermatitis is precipitated by environmental allergens, like pollen and dust mites. These microscopic particles can cause itchy skin, inflamed ears, and goopy eyes in your dog. There are medications available to help ease the irritation that goes along with allergies. For severe skin problems, your vet may recommend allergy testing. It is quite common for dogs to develop allergies to certain foods. Most dogs with food allergies are usually allergic to the protein source in their food, such as chicken or beef. Some dogs are allergic to carbohydrate ingredients like corn, wheat, or soy. Dogs with food allergies do best on diets with limited and novel (something your dog has not been exposed to) ingredients. Generally, this type of food contains one main protein (e.g., duck or fish) and one main carbohydrate (e.g., sweet potato). If you're not sure your dog actually needs a limited-ingredient diet, you may want to try choosing a higher-quality diet instead. Many options are available to help soothe your dog's skin and address the primary cause of irritation. Your veterinarian will be able to help you start a treatment program that should offer relief for your pooch fairly quickly. Recommendations may include allergy medications, prescription flea treatments, oral medications to treat mange or infections, medicated topical shampoos, or a change in food. However, it's important to understand that skin problems in dogs are often ongoing issues that cannot be cured and instead need to be managed over time. It's important to be proactive about skin issues in your dog so they don't get out of hand, and you can do a number of things on a regular basis to prevent the irritation from flaring up again. Use flea and tick preventives regularly and throughout the year. It's important for all dogs, but even more so for those that have a history of irritated skin. Just a couple of bites from a flea can cause major discomfort or impede your treatment efforts. Make sure you know how to properly remove ticks from your dog, just in case one latches on despite your precautions. You want to pull the tick straight out with no twisting or turning and be very careful not to squeeze the tick's body to help prevent infections. The mites that cause mange are easily transferable between dogs. Preventing your dog from contracting them is far easier than treatment. It's vital to keep your dog away from other dogs that you suspect have mange. Maintaining good hygiene—daily brushing, monthly bathing, and regular ear cleaning—as well as a clean environment, can help keep your dog mange free as well. Ensure that you're feeding your dog a proper diet. High-quality foods should include the nutrients needed to promote healthy skin and coat. Many owners prefer a natural diet, and this may help with food allergies as well as ensuring that your dog is getting the exact nutrition it needs. Work with your vet to find the right food for your dog. Bathe your dog frequently. Using a soothing shampoo, such as those with oatmeal or aloe, can bring a lot of relief to itchy dogs. There are many on the market that are designed specifically for irritated skin. Depending on your dog's condition, your vet may recommend a medicated shampoo as well or suggest how often you should give your dog a bath. Help--I Think My Dog Is Allergic to Me! What Causes Lip Sores in Dogs? What Happens When a Dog's Tooth Becomes Loose During Play?